Most educators know that engaging students in visual representations of math is extremely helpful for their learning. The big misconception is that visual math can’t be implemented for higher levels of math, but that is not true. Most manipulatives like geometric solids, two-colored counters, fraction strips, base-ten blocks, counting beans, etc. are only used over the long term in most lower-elementary classrooms. You constantly see these manipulatives spread out at center tables and in small groups in lower-elementary classrooms, yet as students get older, you see them less and less. Because of this, many upper-elementary students think that math manipulatives are for the younger, lower-elementary students or that they are not helpful to their higher levels of mathematics. However, that is simply not true. In fact, research shows that many misconceptions in math are related to the fact that upper-elementary students don’t get nearly enough exposure to visual math and math manipulatives. This research also goes on to say, “While students are encouraged to memorize math facts and calculate problems in their minds, this can actually discourage and decrease math learning, with research showing that students who approach mathematics with a memorization approach are the lowest achieving students in the world.” –Jo Boaler, Professor of Mathematics at Stanford University. This research is very surprising, and it made me think about ways to bring visual math into the upper-elementary classroom. Below are four simple and easy ways you can do this in your classroom. 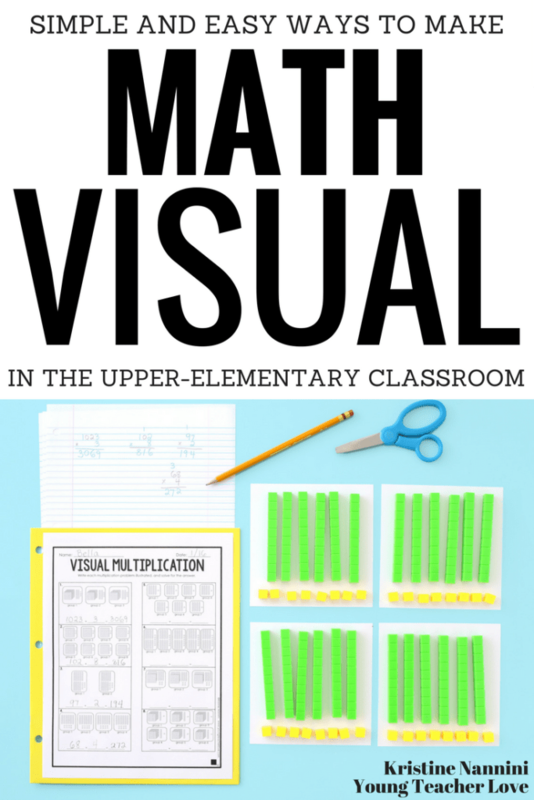 The first step to making math visual in the upper-elementary classroom is to use visuals and manipulatives whenever possible. In my opinion, this one is the easiest. 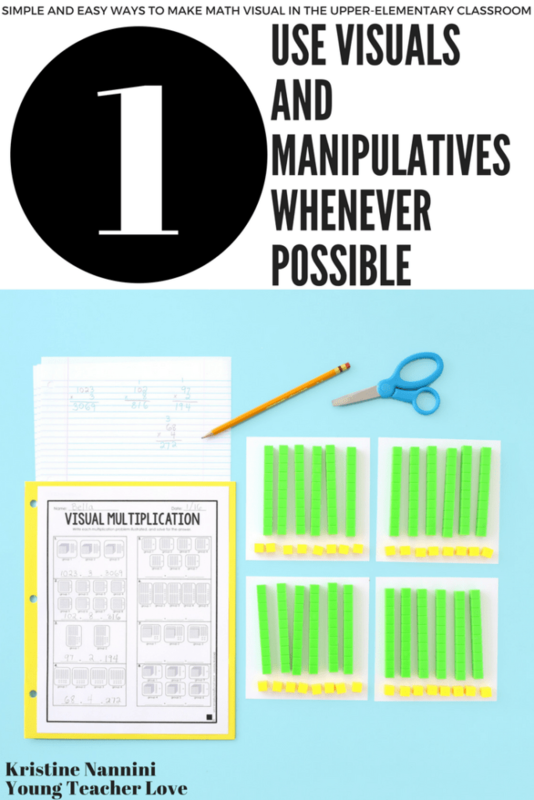 Allow students to have access to manipulatives and any other visual items in your classroom. Explicitly teach students how to handle the manipulatives, and allow a certain amount of time to use the manipulatives to practice different math concepts. The Visual Multiplication sheet above is from my Differentiated Multiplication No Prep Activities and Exit Tickets. I also have a Visual Division version that uses base-ten blocks in my Differentiated Division No Prep Activities and Exit Tickets. 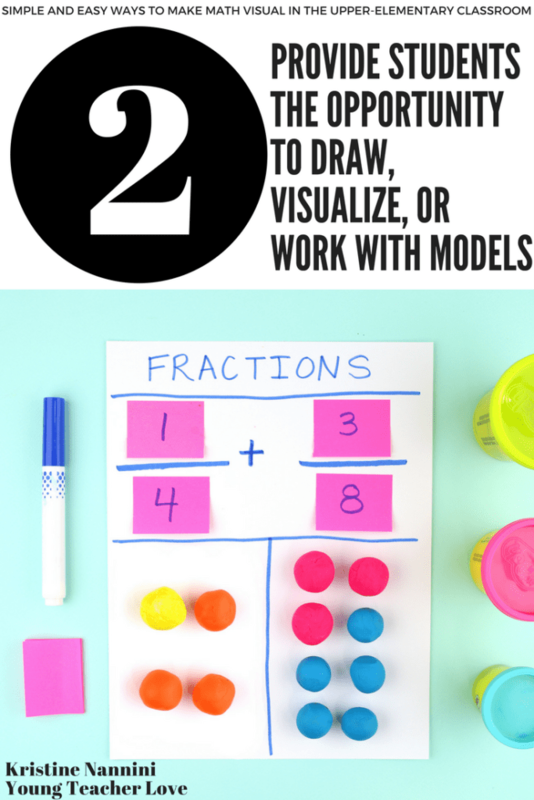 The second step to make math visual in your classroom is to provide students the opportunity to draw, visualize, or work with models during math time. The lesson above is from a blog post I wrote that includes a lesson on Hands-on Fraction. Check it out by clicking HERE. We used play dough to represent different fractions. It was a great hands-on lesson to reinforce these difficult concepts. This fraction tree above was a simple and fun drawing my students completed during indoor recess to show their understanding of equivalent fractions. You can see the original on my Instagram @youngteacherlove HERE. I loved this so much that I decided to use it as a formative assessment during our fractions unit. Most teachers forget that formative assessments can be in the form of drawings. 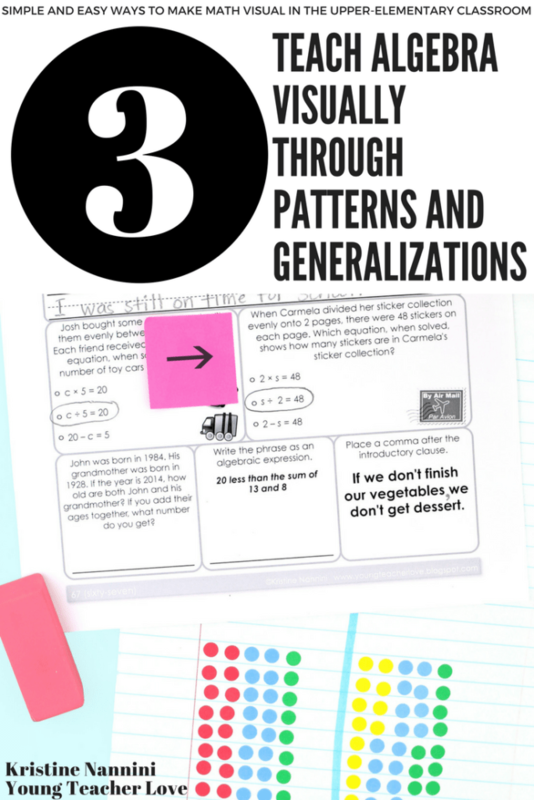 The third step to make math visual in your classroom is to teach algebra concepts by using patterns and generalizations. The problem above about Carmela and her sticker collection is from my Morning Work / Daily Spiral Review. I have this resource for both 4th grade and 5th grade. You can see the 4th grade version HERE and the 5th grade version HERE. Algebra can be a tough subject to teach. In my opinion, it is a very visual subject to teach, yet we don’t always make it visual for our students. Some students were struggling to understand which equation was correct in this problem. To help students, we got out our own stickers and started dividing them onto sheets so students could see the pattern and make generalizations about the problem. This is a very easy solution to a sometimes difficult concept. 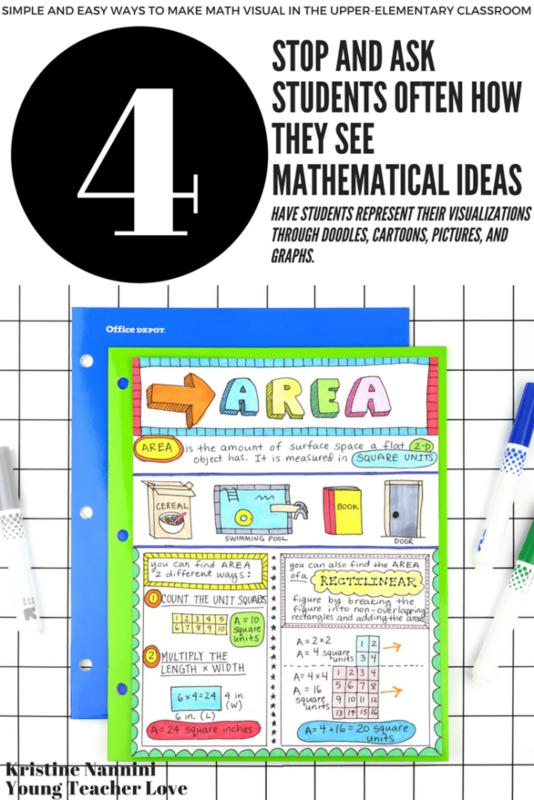 The fourth step to making math visual in the upper-elementary classroom is to stop and ask students often how they see mathematical ideas. 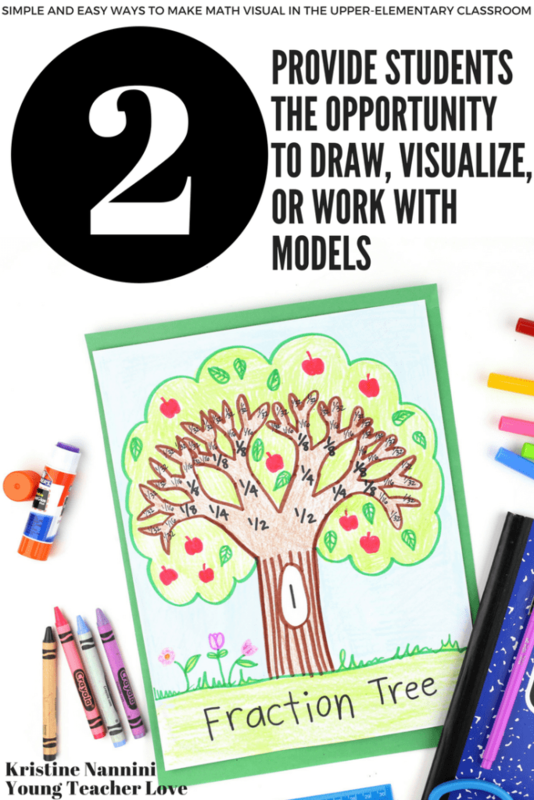 Allow them to represent their visualizations through doodles, cartoons, pictures, and graphs. This differentiated area doodle is based on my Differentiated Area No Prep Activities and Exit Tickets that is coming soon. 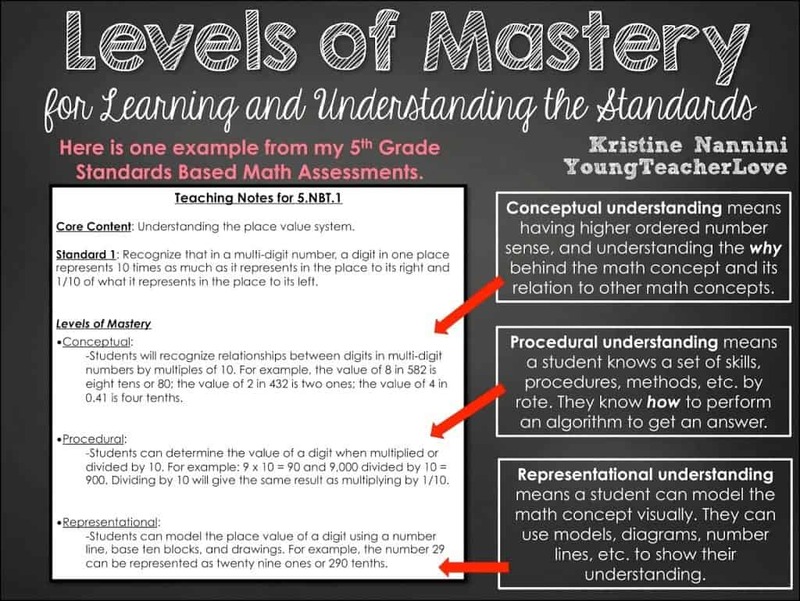 One of the most common things I hear from teachers is that they don’t know how to have students show a representational understanding of the math standards. I get many emails from teachers asking for help on this particular issue (which is why I wrote this blog post!). 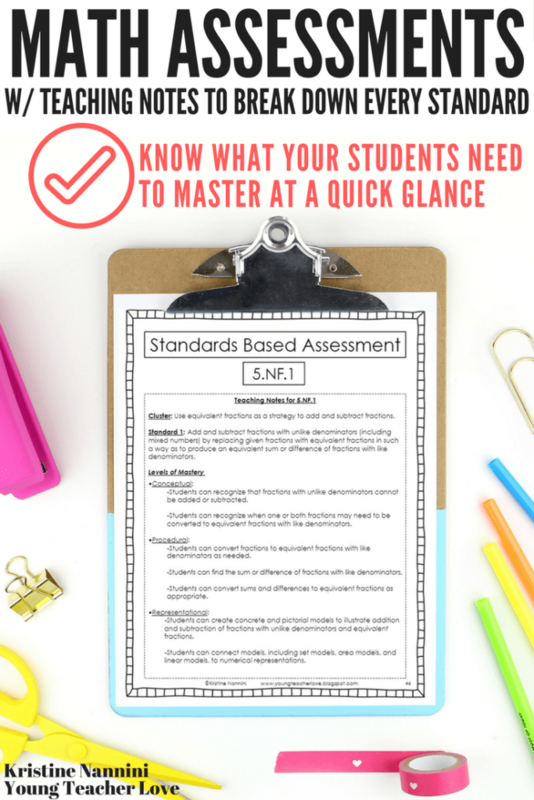 These assessments have been so helpful to teachers as a quick guide on how students can visually show their understanding of a math standard (in addition to conceptual and procedural understanding). You can read more about my assessments on my blog HERE.